Venturini Motorsports (VMS) and off-road racing specialist, Gavin Harlien, 19, announced today the signing of a three-race deal to compete in the ARCA Menards Series (ARCA). Harlien, out of Phoenix, Arizona, will make his stock car driving debut in the ARCA series behind the wheel of VMS’ No.55 Toyota Camry at Gateway Motorsports Park on June 22. The former X-Games competitor will also make series’ starts at Iowa Speedway (July 19) and Salem Speedway (September 14). Sponsorship details for Harlien’s VMS prepared Toyota is forthcoming. “I have been looking for an opportunity like this for a long time,” said Harlien. “Taking this next step in my career and moving up into ARCA with a top-notch team like Venturini Motorsports is a dream come true. Now I’m just eager to start the journey and learn as much as I can in my first few races. 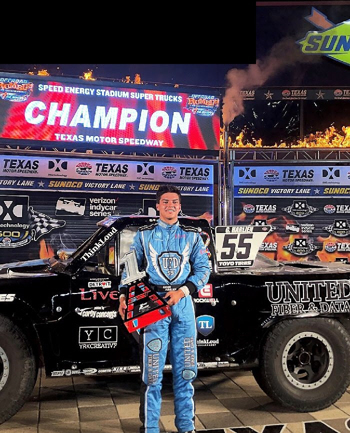 Rooted in the world of off-road truck racing since the age of 11, Harlien has gone onto achieve notoriety and success in the sport throughout his young career. Displaying talent behind the wheel early on, he captured rookie of the year honors in the Lucas Oil Off Road Series’ Modified Kart Class in 2012 and again after moving up in rank driving in the series’ Pro Lite Truck division in 2014. During his time driving on the Lucas Oil Off-Road tour he posted 10 victories and 42 podium finishes. Currently competing for a championship in Robby Gordon’s Stadium Super Truck (SST) Series, Harlien’s career spans the globe – racing multiple disciplines, series’ and events on dirt including SST, Lucas Oil Off Road, The Off Road Championship, Red Bull Global Rally Cross, the Lucas Oil Chili Bowl Nationals and Sprint Cars. Following in the wake of last year’s ARCA Menards Series’ champion, Sheldon Creed, the fellow west coast driver will make the jump from off-road to stock car racing. With 54 all-time victories, Venturini Motorsports, an official Toyota Racing Development team, has been a permanent fixture in the ARCA Menards Series since 1983 and is considered one of the early pioneers in NASCAR driver development programs. Since Joey Logano, last year’s 2018 Monster Energy NASCAR Cup champion, raced for the team in 2007, VMS has gone onto assist many of the sports’ top driver prospects in pursuit of making it to the highest levels of stock car racing. The growing list of drivers racing today in one of NASCAR’s top-three touring series include current Toyota drivers Erik Jones, Christopher Bell, Harrison Burton, Christian Eckes, Chandler Smith, Brandon Jones, Todd Gilliland, Brennan Poole, Ryan Reed and Natalie Decker. VMS Alumni also include Joey Logano, William Byron, Ryan Blaney, Alex Bowman, Daniel Suarez, Bubba Wallace, Matt Tifft, Noah Gragson, Justin Allgaier and Justin Haley.